Utilizing Nikon’s CFI60 optical system and LED illumination for both diascopic and epi-fluorescence imaging, the new Eclipse TS2 microscope offers clear images, enabling more efficient cell culture observation and documentation. 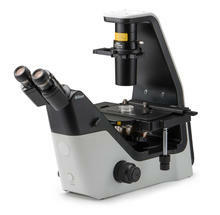 The Eclipse TS2 microscope provides LED-based diascopic and epi-fluorescence illumination. LED illumination eliminates frequent bulb replacement and alignment and requires no warm-up time allowing for quick and efficient cell culture observation. Furthermore, a newly developed contrast observation method and streamlined operation enhance its use for routine laboratory work.